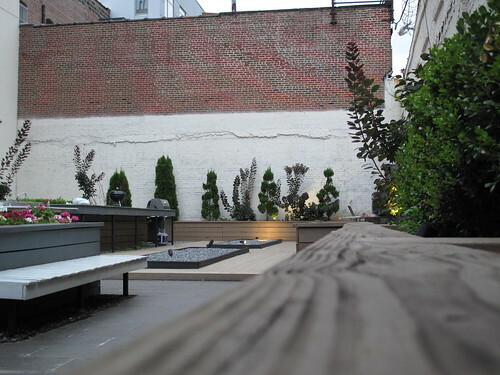 Our friends’ wedding rehearsal was held in the courtyard of their Brooklyn apartment. The patio and deck were surrounded by raised beds dominated by foliage plants – boxwoods punctuated with purple leafed smokebush, with a collection of meticulously pruned conifers at the end of the garden. The only flowers were island containers of pink pelargoniums. I wouldn’t ordinarily go for such formality or fancy pruning, but surrounded buy buildings and tall walls topped by barbed wire, it worked, and it was charming. With blue painted benches, it had a beachy, boardwalk feel about it. It was nice to see the space full of life, with building residents out taking advantage of the ample seating space, hanging out at the tables with their computers working, or with their families talking. You can get a little deprived of private outdoor spaces here so it was such a treat to get to hang out there. 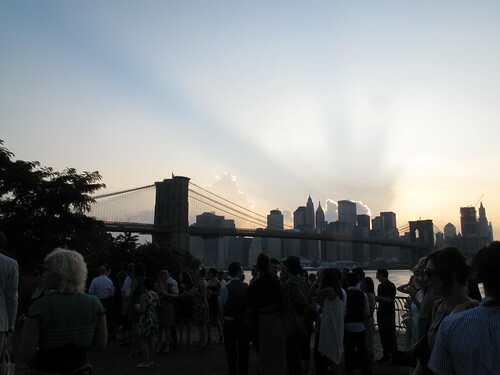 The wedding itself was in Brooklyn Bridge Park. There was some pretty amazing lighting behind the clouds looking back on the city, the camera didn’t quite do it justice, but you can still see the ring of light. Pretty good luck to have such a beautiful backdrop for the wedding. The Brooklyn Bridge Park is right on the waterfront, with some rocky steps and access to the water’s edge. In among the rocks, in terrain that’s usually inhospitable to plant life, there was this flowering plant. Am I crazy, or is this a datura growing here? There weren’t any others around, I don’t know where it would have come from, but I liked the adventurous spirit of the little thing. 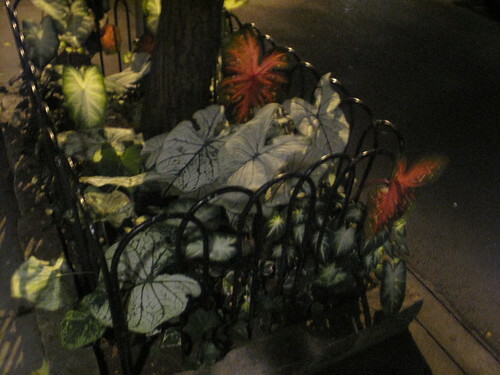 Back in Manhattan one night, we came upon this person’s little patch of garden, planted full up with Caladiums. I like to see a diehard gardener, doing what they can with what little dirt they can find. I loved the way the leaves glowed when backlit with headlights from the oncoming traffic. 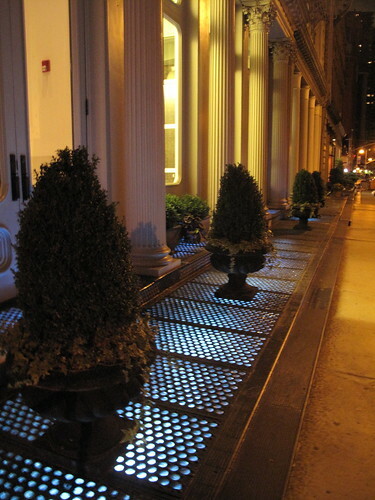 The planters themselves by our hotel in Tribecca weren’t anything out of the ordinary, but the lighting at their feet made me smile every time I passed by. 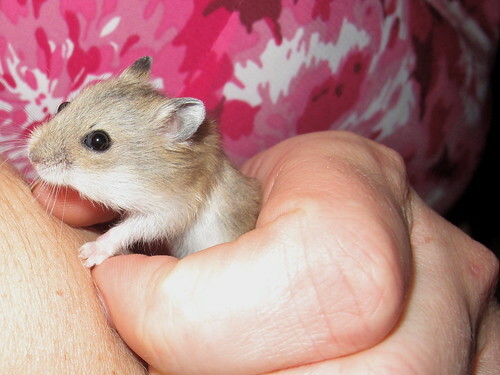 Just before I left Portland, my foster hamsters were grown up enough to be separated into groups of boys and girls, and to head back to the humane society to find their forever homes. Seems impossible when they’re still so tiny, but their three weeks was up, they were weaned and ready to go, even the runt who was half the size of his sibblings (the one in the picture is one of the bigger ones, so you can imagine how small the runty one was). Some fosters hit me harder than others when they head out into the world, and I admit, these little guys stole my heart. I’ll cop to a little temptation to keep a couple, but if I did that every time I felt sentimental about the critters, I’d have less space to help out when some temporarily homeless animals need a place to crash for a few weeks. Good luck out there, little buggers! Hi Megan~~ What a cutie pie! I can see how easy it would be to get attached. 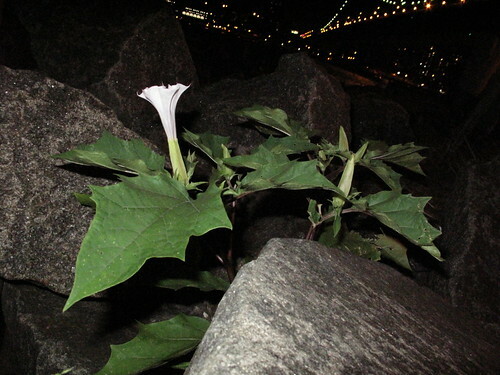 … That is a Datura but the “weedy” or “native” species. I think it’s called Jimson Weed or Thorn Apple. Tenacious bugger isn’t it? The hotel’s lighting is very cool. Adorability. Wow, that wall of pruned plants is downright sculptural! I like the private garden plaza but you could probably suggest a few things for the pelargonium spot to spice things up a bit. Maybe some grasses or is that too passe? Your friend’s wedding looks to have been lovely, how nice that the sky cooperated. You have a bit of romantic history with that park too if I’m not mistaken?? Safe travels. Megan, don’t you know NYC is trying very hard to get away from its reputation of beating up on everyone-even plants? :) We can’t have any plant fights in the horticultural world ya know. I like how those plants are underlit and that baby hamster is too cute! Grace – Aha, a weedy type Datura. I didn’t know about those. Maybe that’s what I need in my yard, since I can’t seem to grow the good kind. Karen – I agree, grasses would be way better than pelargoniums, and they’d have a much longer season of interest. Your memory is correct, I got engaged at the Brooklyn Bridge Park, almost exactly three years ago. Tina – Well these plants are pretty tough. Mine think they have it rough going a week without water, but the plants here, they show true courage. They don’t throw their weight around, though, unless it’s really called for. I didn’t know there was a weedy Datura relative! Very interesting. I love the sky over the city, that is a beautiful shot, what a wonderful location for a wedding, or a proposal . Congrats on the successful nurturing of the little babies!